I was on my way out of Missoula Montana and I needed to fill up my gas tank. I stopped at a gas station across the street from this motel. The sign caught my eye right away and I knew I had to get a picture. I am sure that sign must look awesome at night! Next time I’m down in Missoula I am definitely going to make a point to get over there at night and shoot another photo of that awesome sign. This entry was posted in Architecture, Cities, Travel and tagged 24-70mm, A7R, America, hot tub, indoor pool, Jacuzzi rooms, landscape, M, Missoula, Montana, mountain, MT, Photography, river sundeck, Sign, sky, small city, sony, Thunder Bird Motel, town, Travel, Urban, USA, vsco, Zeiss. Bookmark the permalink. I love the Thunder Bird! Our son went to college right across the river. He left the midwest to go there and he loved it so much, he still lives in Missoula. Doesn’t use the degree he got there, but he found the place he was meant to be. Oh that’s wonderful. And not using his degree hey, seems rather common haha. Free Wi-Fi too, I bet! Ha! We were there this time last year but running from the wildfires, so to speak. Haha ya I would hope so! That’s cool you were out there though. I like it there. Cool little town :). 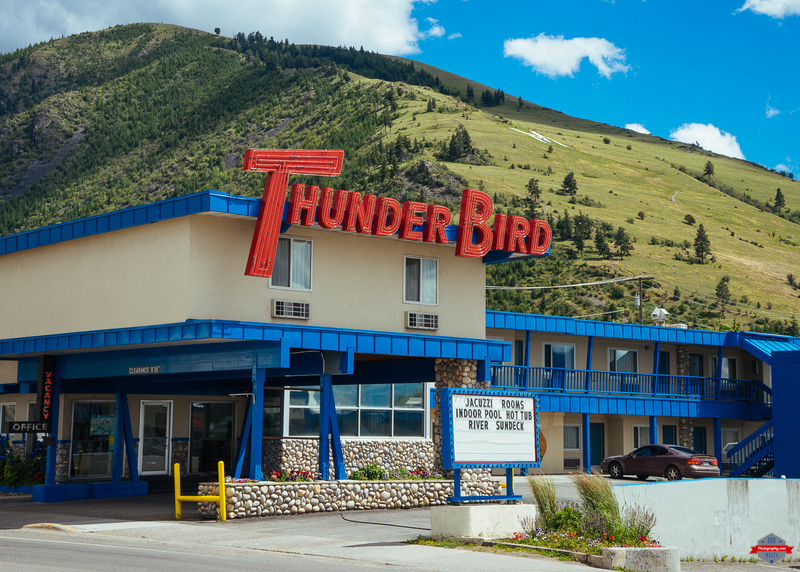 The colors in THUNDERBIRD are striking … and the photo evokes memories of places from the late 50s / early 60s. Nice. LOL your hilarious! But yes, I love the nostalgic feel of this photo too. I wasn’t around for all that stuff you mentioned, but I wish I was, because I love that kind of stuff :). Oh no way, thats awesome. I’m gonna look it up for sure!